Nikon Corporation is pleased to announce the release of the new Nikon 1 S2, the latest addition to the S series of Nikon 1 advanced cameras with interchangeable lenses that propose new forms of imaging expression. The Nikon 1 S2 is the latest model in the Nikon 1 S-series, developed for those using an advanced camera with interchangeable lenses for the first time. The S2 enables capture of beautiful images, with simple operation and performance with tracking of moving subjects that exceeds that of digital SLR cameras, as well as a variety of functions, all in a compact and lightweight body that offers the superior portability that is a primary feature of Nikon 1 cameras. An intuitive and clear GUI has also been adopted to make the camera easier to use. The S2 is also equipped with a Creative Palette that allows users to freely change imaging effects with simple operation of the rotary multi selector. A variety of movie functions, including support for recording of 1920 x 1080/60p full-HD movies and Auto Image Capture during movie recording, as well as new advanced movie functions such as Fast Motion, Jump Cut, and 4-second Movie stimulate user’s creative intent. What’s more, the seamless exterior inherited from Nikon 1 S1 has been refined for a more elegant design in a body that is slimmer and lighter. In addition to the standard white, black, and red, the S2 is also available in a distinct yellow. *Among digital cameras with interchangeable lenses available as of May 14, 2014. Statement based on Nikon research. Moving-subject tracking performance superior to that of digital SLR camerasAt approximately 20 fps, the S2 achieves the world’s fastest* continuous shooting rate with AF tracking. An even shorter shooting time lag, ultra high-speed AF capable of capturing the perfect moment, ultra high-speed continuous shooting, and Best Moment Capture mode, useful when it is difficult to gauge the best time to press the shutter-release button, enable optimal response for capturing subject movement or fleeting expressions. Equipped with an effective pixel count of 14.2-million pixels, a super high-speed AF CMOS sensor with no low-pass filter, and the latest EXPEED 4A image-processing engineThe S2 captures images exhibiting excellent detail and very little noise over a broad range of sensitivities, from ISO 200-12800. In addition, it is equipped with a noise-reduction function that minimizes noise, even with shooting in dark surroundings, by taking multiple shots that are then combined to create a single photo exhibiting superior image quality. 1920 x 1080/60p full-HD movie with built-in vibration reduction function1920 x 1080/60p full-HD movies up to approximately 10 minutes in length can be recorded. The electronic vibration reduction (e-VR) function built into the camera can be used to process movies to reduce the effects of camera shake that occurs with movie recording. Auto Image Capture during movie recordingDuring movie recording, the camera automatically records full-sized still images without interrupting movie recording. The maximum number of photos that can be taken during recording of a single movie is 10. Advanced Movie mode allows users to record movies in [P], [S], [A], or [M] movie exposure mode, and a number of convenient functions that make recording and editing movies simple have been addedFast Motion: Fast-motion movies that play back at about four times normal speed are recorded. Playback time is one quarter the recording time.Jump Cut: Recording pauses every other second for a drop-frame effect.4-second Movie: Recording automatically stops after four seconds. This creates a short movie suitable for posting on social networking services and the like. In addition, up to eight clips can be joined into a single movie using the Combine 4-second Movies option in the playback menu. Movies created using this option can be transferred to, and shared with, a smart device via Wi-Fi connection when the Wireless Mobile Adapter WU-1a (available separately) is connected to the camera. Feature menuBy simply pressing the feature button on the multi selector during shooting or with image playback, detailed settings that can be quickly adjusted are displayed. Creative PaletteUsers can preview creative effects such as brightness, vividness, and white balance in real time by simply rotating the multi selector. Images exhibiting the desired results can then be captured by simply pressing the shutter-release button when the preview display reflects the user’s intent. Creative mode for selecting an effect or sceneBy simply specifying an effect prior to shooting, users can easily enjoy a variety of forms of expression. Sample images provide a preview of the effects of current settings for verification prior to shooting. A compact and lightweight body available in a variety of distinct colorsThe S2 offers the superior portability that is a primary feature of all Nikon 1 cameras with a more compact body that has been refined for a more elegant design. 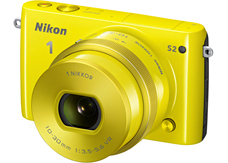 In addition to white, black, and red, the S2 is also available in a new, attractive yellow. Lenses sold as part of lens kits with camera bodies are the same color as the camera body. This color coordination achieves an integrated look despite the fact that the camera uses interchangeable lenses.